Digital information display in US magazine. When we thought we’ve seen it all, we’ve realised that we haven’t. The advertising industry seems to favour the use of screens so we’re continuing our series of digital signage in unexpected places. 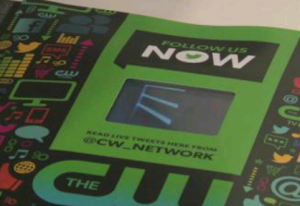 After Marie Claire’s video advert within its latest issue, Entertainment Weekly- the American magazine published by Time Warner inserted a tiny screen featuring clips of two shows and Twitter feeds of CW Television Network. The small Chinese LED screens (which proved to be simplified versions of smartphones, as Mashable revealed after a ‘hacking exercise’) have been inserted in 1,000 copies of the magazine but unless you live in LA or NY you can’t get hold of one. 1) Digital signage and print don’t necessarily exclude each other as the latter creates a bridge- once inaccessible to the former- leveraging a company’s digital world. 3) Measure, measure and measure again. According to CW Televisions’ VP of Marketing, there isn’t a proper analytics system behind the campaign but they’re going to monitor the Twitter activity succeeding it. The number of new Twitter followers is a fairly accurate indication of the campaign’s success and even though not perfect, it’s a start. Watch the video below to see the screen in action. Our Pinterest followers might have already learned the news about Marmite, the British savoury spread brand, that will celebrate Christmas with a big digital signage install above Selfridges’ store in London (on Oxford Street). The digital advertising screen will show the brand’s Christmas characters loving or hating Marmite and will allow the public to see their own photos displayed thanks to a Facebook app that will be launched closer the holiday season. You will certainly find out in the weeks to come, as we’re working on some stories on digitalsignage.NET (just a hint- watch out for InAVate’s November issue ;)) Wish us luck! Stay in touch by signing up to our newsletter and spread some love by sharing the news if you’ve enjoyed them. We are one of the longest standing digital signage providers in the world, whose solutions are reaching over 30 million consumers every week, all around the globe. digitalsignage.NET, our cloud- based digital signage solution enables organisations from various sectors to disseminate timely and accurate information on interconnected screens installed in their locations. This entry was posted in Marketing and Advertising and tagged advertising, Chatter, digital signage by Dynamax. Bookmark the permalink.